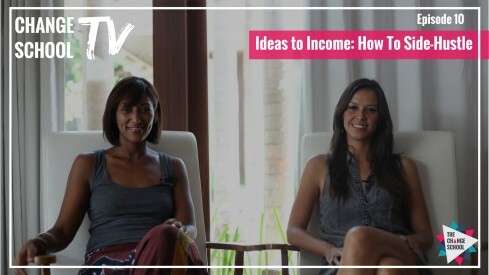 In this week's Change School TV episode, Grace and Solonia share their experience, insights and tips for how to create a side-hustle without quitting your day job. A side hustle is a second job that not only brings in money but also allows you the flexibility to continue working your day job. Whether you’re working for the man, or for yourself, creating a side-hustle is a great way to earn extra income and leverage any talents, skills or interests that aren’t being fully utilised in your current role. Side-hustling is also a good option if you’re thinking about a career change by reducing / eliminating the risk of compromising job security while exploring other options. This also allows you to ‘test-drive’ alternative business / career ideas before committing to a new direction or any major decisions. It can also help you to gain more confidence in your abilities and the lucrative potential of doing something outside of your current job / work scope. The beauty of many side-hustle opportunities is that they don’t usually require a huge initial investment or even a highly specialised skill-set. But let’s be very clear: a side-hustle is hard (and ‘extra’) work. It takes commitment, careful planning, and a lot of self-discipline to manage your time and energy effectively in order to reap the full benefits and not burnout. Why do you want to side-hustle? Whether you’re looking to boost your income, pay off debts, increase your savings, or gradually transition to a new line of work, knowing your why is always the best place to start. Pre-defining your goals and objectives will help you stay focused and motivated to get the results you want. What type of a side-hustle do you want to do? A side-hustle doesn’t necessarily have to be a ‘business idea’ - though it can be. It all depends on your circumstances and goals. Becoming a dog-walker, baby-sitter or Uber/Lyft/Grab driver are good examples of non-business-idea-hustles. Doing freelance work, coaching/consulting or selling an online course on the other hand will require more time and effort - especially during the initial stages of setting things up. Decide whether you are looking to do something simple for some extra bucks or build something bigger with a view to make it self-sustaining. How much time can you spare / create? It’s important to be realistic about the time you can carve out of your daily schedule to build and sustain a side-hustle with ease and without over-committing yourself or burning out. Whether you’re planning to put in extra hours during the week or a day over the weekend, be prepared to make some adjustments to your lifestyle as may be required. Write your answers down on paper - think of it as the start of your Side-Hustle Strategic Plan. Start out by brainstorming all the things you could do. What are you really good at? Do you have a special hobby or skill that you could teach someone? What do you know that others would like to know? Is there something people always come to you for? Something you love doing? Make a list of everything you can think of that you do best and/or would enjoy to do for extra cash. Create a simple plan of action for your side-hustle. Write down what you plan to do, figure out how and when you’ll schedule it into your day / week, and make a list of the steps you’ll need to take to get started. Once you have your grand master plan, it’s time to get into action. Identify who you need to reach out to - potential companies, customers or people who can help you to implement your plan. Good old Google search is always a good place to start, and utilise social media (search and groups). If your plan is to start a business, leverage your network and seek out relevant communities, meetups and events and get hustling! Download this week’s FREE Side-Hustle Master Plan Workbook to help you work through the steps.